This video demonstrates the audio surveillance microphone and 1080p HD video surveillance capability of the AHD-PIR18 hidden spy camera. In this video, we are testing the audio surveillance microphone that is built into our hidden motion detector security cameras. This is an audio test using CCTV camera pros hidden PIR camera. I'm also capturing video from the camera and I'm using the 1080p HD version right now but it's the same microphone in the CCTV, the 720p HD and the 1080p HD version. The microphone is the same. The only difference is this is the 1080p high def video version. Right now I'm about 3 or 4 feet away from where the camera is mounted and I'm going to move back about 10 or 11 feet away so you can hear what the audio is like from this distance. I'm going to move back again. This room is 21 feet long this way. Right now I'm 21 feet away from where the camera is mounted and this room is 13 feet wide. As you can hear, this microphone works very well in a medium size room like this. It will work well in something even a little bit bigger and obviously it will work well in anything that's smaller. 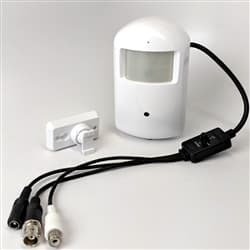 CCTV Camera Pros carries several different models of this hidden motion detector camera. All models come in the exact same PIR sensor housing that you see here. We have an analog CCTV version that works with any traditional CCTV DVR. We have 720p and 1080p analog high definition models and we also have 1080p HD-TVI and 1080p HD-SDI models. All camera models use the same audio microphone so users can expect the same quality of audio surveillance that was captured in this video. All models use 940 nanometer infrared LEDs that are hidden behind the PIR sensor window. 940nm LEDs are invisible. They do not emit a red glow like traditional infrared cameras. The lens of all camera models captures an approximate 90 degree field of view. CCTV Camera Pros supplies these cameras for home, business and government surveillance systems. For more information please visit www.cctvcamerapros.com/PIR. Thank you for watching. Click here to learn more about the AHD-PIR18 1080P HD Hidden Spy Camera used in this video. AHD cameras are available in many different models including indoor, outdoor, dome, bullet, box, and even hidden spy cameras. Click here for to see the latest models available. iDVR-PRO surveillance DVRs support AHD cameras in 720p and 1080p resolution. In addition, iDVR-PRO DVRs are hybrid and can also support analog CCTV cameras and HD-TVI cameras (720p and 1080p). Learn more about iDVR-PRO below. Click here to learn more about the latest iDVR-PRO hybrid CCTV DVRs.